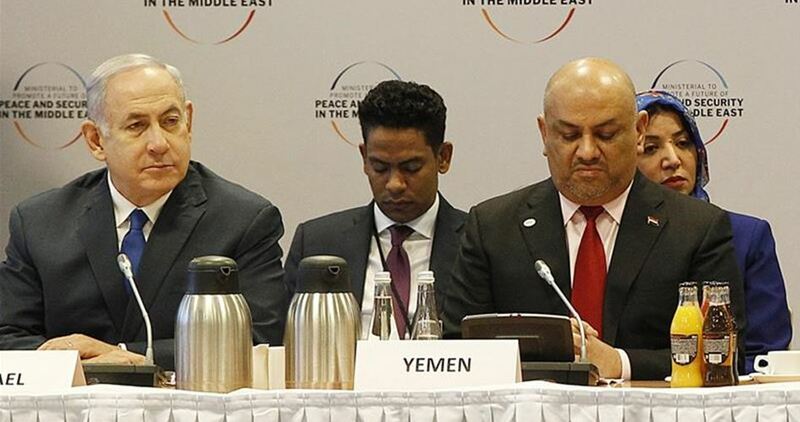 Yemen's foreign minister Khaled al-Yamani has been widely criticized, especially by his own people, after pictures showed him sitting next to and smiling at Israeli premier Benjamin Netanyahu at a recent conference aimed at isolating Iran. Al-Yamani was seated next to Netanyahu during the opening session of the Middle East conference in the Polish capital Warsaw. During a part of the session that was closed to the media, the Yemeni minister was reported to have let Netanyahu use his microphone when his stopped working. The pictures, which were published by several media outlets, have sparked a public backlash against al-Yamani, although he tried to defend himself by claiming that a “protocol error” by the organizers of the conference landed him next to Netanyahu. Social media users, including noted figures, from Yemen and other Arab countries strongly denounced the Yemeni foreign minister and some called for removing him from his post. 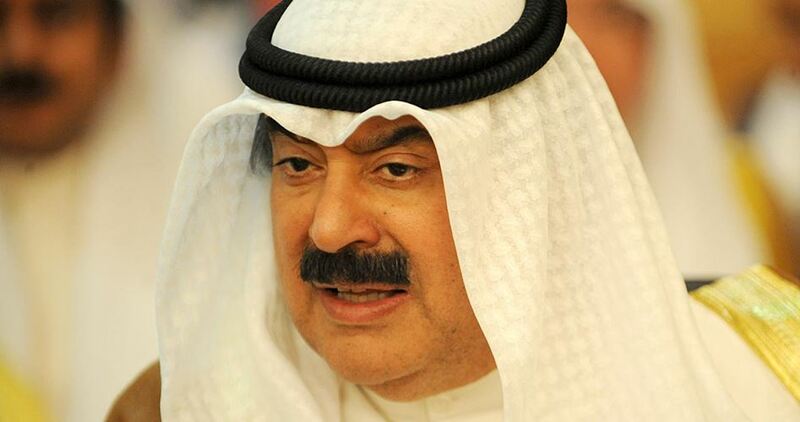 Kuwait's Deputy Foreign Minister Khaled Al­Jarallah on Friday affirmed that the stance of Kuwait is clearly and firmly opposed to normalization of relations with Israel. "The State of Kuwait will be the last country to normalize relations with Israel," he said, noting "anybody would be mistaken if they imagined that the group picture taken at Warsaw conference signal a change in Kuwait's firm stand on this issue." "Kuwait took part in Warsaw peace and security conference under joint invitation from the United States and the Republic of Poland with which Kuwait has close relations and allied itself in some issues." "Besides, the issues on the agenda of the conference have to do with the future of security and peace in the Middle East of which we are a part," Al­Jarallah said in response to speculations circulated by social media. "It would be illogical that these topics, including the Palestine question and the developments of the Middle East peace process, are discussed in our absence. Our participation in the conference stemmed from keenness on defending these issues, not plundering them." "We made our point clear at all international forums, foremost among which is the UN Security Council through our non­permanent membership," he explained, adding that Kuwait's principled stance was highly appreciated by "the Palestinian brothers." He reiterated that Kuwait will be the last country to normalize relations with Israel after the realization of a fair and comprehensive solution to the Palestine question and the establishment of Palestine State with East Jerusalem as its capital based on the relevant resolutions of the United Nations, the Arab peace initiative. Turning back to the group picture, he said that normalization of relations between countries has various forms that do not necessarily include taking group pictures at international conferences. Kuwait participated in Warsaw conference alongside with other sisterly countries in the Gulf Cooperation Council (GCC) whose participating delegations were of higher level than that of Kuwait, he noted. The conference was similar to the other numerous international gatherings in which Israel takes part, including the forums being held under the UN umbrella, he added. 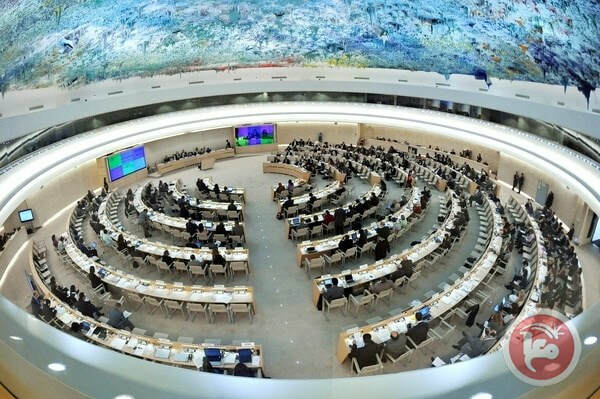 The United Nations Human Rights Council is planning to issue seven resolutions against Israel during March, according to Israeli news outlets. Israeli Channel 2 reported that a report of the Commission of Inquiry into the "Gaza Fence" and the black list of businesses operating inside illegal Israeli settlements and beyond the Green Line will be among the resolutions to be made. The UN Special Coordinator's report in the Palestinian lands will also be reviewed, in addition to the Goldstone Report of 2009 and Israeli violations in occupied Golan. Israeli violations of the International Law will also be reviewed by the UN Human Rights Council. 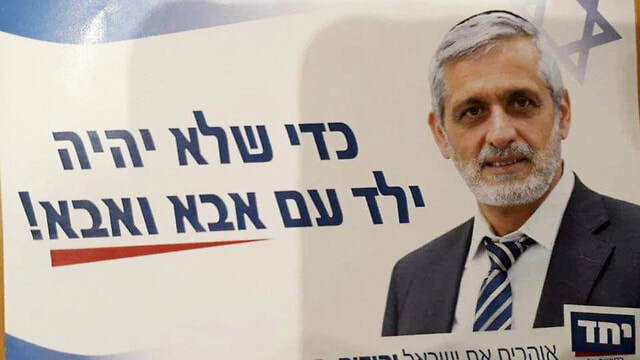 As a union among small right-wing parties looms, Yachad’s Eli Yishai affirms his belief that only a traditional family unit is appropriate, raising the ire of LGBT groups. Yishai said the posts, seen by many as homophobic, were made by Yachad Party activists. He refused to condemn the message and said that he has yet to decide whether to use the message in official campaign material. “In the Jewish tradition there is a father and a mother and children makeup the next generation. I will not utter a word against the Torah of Israel,” he said. “When considering values and tradition, I look at what is the most appropriate thing. I want the public to see our agenda on how to improve the lot of young couples, the health and welfare service,” Yishai added. He also said that he intends to accelerate the expulsion of African migrants from the country. Arieli charged Yishai with incitement against the gay community out of desperation to make headlines ahead of a possible union among Right wing parties vying for Knesset seats. Yishai said that the parties on the fringes of the right-wing, Moledet and Bayit Yehudi, will unite, adding that in such a union the party will garner 10 seats. Yishai rejected allegations that the main motivation behind the union is his political survival, insisting the two parties share the same ideology: Torah and Jewish traditions and ethics. Yishai said that the Knesset always had a religious lobby. He views it crucial that votes for the right not go to waste as often happens when parties don’t pass the Knesset entry threshold. “If Netanyahu is not able to form a broad right wing coalition, we will find ourselves with a leftist government,” he said, expressing unequivocal support for the prime minister. LGBT activists did succeed in having the Prima hotel chain reject a campaign waged against the gay community by the Hazon (Vision) organization and the hotel took down such signs—stating that a “normal” family includes a mother and a father —that were hung on their Jerusalem location. The hotel’s Director Avi Dor apologized for the signs which he said were placed by a third-party advertising company. Adalah demands Israel provide voting stations in unrecognized Naqab Bedouin villages; thousands of people with no access to public transportation forced to travel up to 50 kilometers to vote. Eleven unrecognized Bedouin villages in Israel’s Naqab (Negev) southern desert region have no polling stations or public transportation and some of their thousands of residents will have to travel up to 50 kilometers to vote in the upcoming national elections on 9 April, 2019. Adalah – The Legal Center for Arab Minority Rights in Israel sent a letter on 2 February, 2019, to Israeli Central Elections Committee Chairman Judge Hanan Meltzer and Interior Minister Aryeh Deri demanding that polling stations be placed in these Bedouin villages. Adalah Deputy Director Attorney Sawsan Zaher detailed in her letter 11 Bedouin villages with a total population of some 40,000 residents, many of whom are required to travel dozens of kilometers from their homes – partly on foot – in order to exercise their right to vote. Many of these communities lack public transportation and many residents do not own private vehicles. Members of the El Azazma tribe living in the village of ‘Abda, for example, must travel 50 kilometers to the government town of Segev Shalom in order to vote. 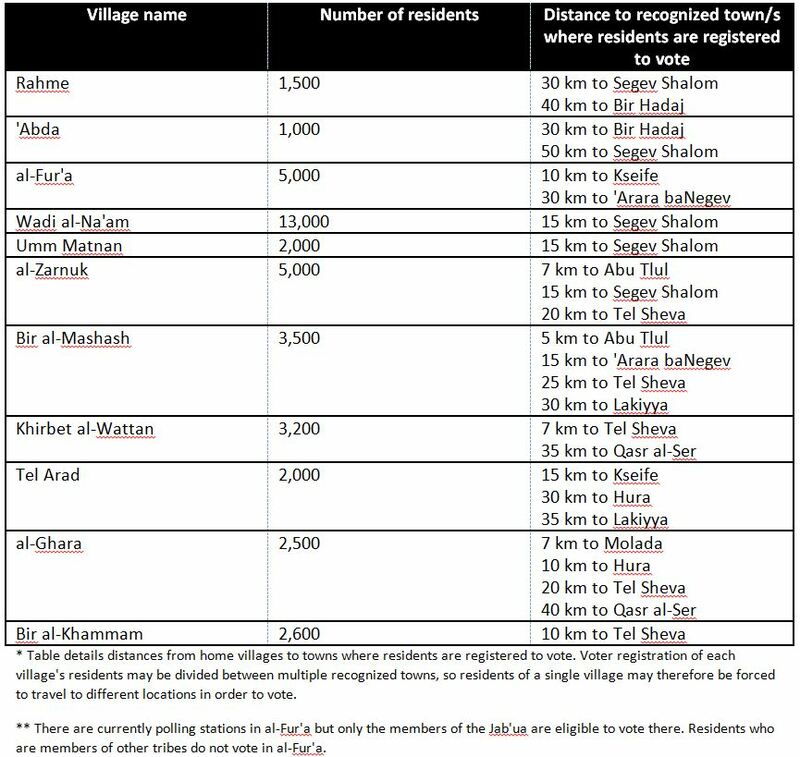 The absence of polling stations in the Bedouin villages is one of the main reasons for the low voter turnout among this population. The villages of Rahma, ‘Abda, al-Fur’a, Wadi al-Na’am, Umm Matnan, al-Zarnuk, Bir al- Mashash, Khirbet al-Wattan, Tel Arad, al-Ghara, and Bir al-Khammam – despite being unrecognized by the state – nevertheless all have public health services and education buildings that were approved in outline plans vetted by Israeli authorities in which the Elections Committee is being asked to place ballot boxes. Adalah stresses that harming citizens’ access to polling stations constitutes a grave and disproportionate violation of the constitutional right to vote enshrined in Israel’s Basic Law: The Knesset (Article 4). The law also stipulates that the Central Elections Committee must finance transportation for the purpose of exercising voting rights. Prior to the previous Knesset election, the Central Elections Committee chairman rejected Adalah’s request calling to provide transportation to voters in unrecognized villages, claiming that public transportation lines situated along main highways was sufficient. However, low voter turnout figures from that election indicate that this failed to remedy the situation. Below data on the concerned villages was collected by Marwan Abu Frieh, Adalah’s Naqab Office Coordinator and Field Researcher, and Amir Abu Kwider, parliamentary aide to MK Juma’a Zabarka. (Note: The number of affected citizens is estimated as the state frequently and systematically fails to collect data on Bedouin citizens of Israel, thereby leaving them absent from relevant surveys, statistical reports, and other sources of information). The National Bureau for Defending Land and Resisting Settlements said, in its weekly report, that, according to data published by the Israeli Central Bureau of Statistics, the government of Israeli Prime Minister Benjamin Netanyahu has established, during the past decade, 7 new settlements in the occupied West Bank, including six “settlement towns” and one settlement bloc named “Modi’in,” in addition to a “settlement town” in occupied Jerusalem, all of this on top of the expansion of existing illegal settlements and outposts. Within the same context, a recent report issued by Israeli rights group B’Tselem stated that the Israeli Supreme Court is now legitimizing Jewish settlements in the occupied West Bank, including East Jerusalem, in contravention of international law. According to B’Tselem, Israel has established 2 judicial systems, i.e. 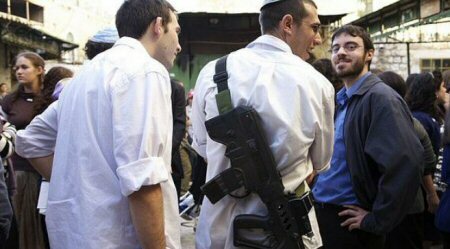 a civilian system for the settlers, and a military one for the Palestinians. The report confirmed that the “supreme” administration adopts the structural schemes of the British Mandate, from 80 years ago, which does not suit the current situation. The Kerem Nebot organization stated that the Settlement Department granted housing loans, from public funds, for illegal construction, as is the case in the illegal settlement of Eli. Documents of the Israeli Land Registrar showed that, in 2010, the Histadrut branch of the Settlement Department granted a loan to a settler and his wife, although it is not allowed to give loans for illegal houses. To be sure, this is not the first time that the department has given such a loan for the purpose of building illegal settlements and outposts. It is known that, since the 1990s, the Settlement Department has helped to establish many settlement outposts throughout the occupied West Bank, including the Sakari farm, the Itamar farm, Giv’at Awalam and Amona, among others, and granted housing loans to settlers, from the public funds, as also is the case for the Itamar settlement, south of the city of Nablus. There is an additional plan to raise the number of settlers in the occupied West Bank to 2 million, and to build large settlements in all areas of the West Bank. Knesset speaker Adelstein, besides a number of ministers and members of the Knesset, signed a pledge that includes the housing of 2 million settlers, in the West Bank, a promise to work on “liberating” land in the West Bank, and to cancel the declaration of 2-state solution ahead of elections to be held next April 9th, 2019, in order to gain the votes of Israeli settlers. Within this context, Minister of Tourism Yariv Levin affirmed that the government’s goal is to accelerate settlement construction in the in the West Bank, in order to absorb one million Jewish settlers in the near future. On the other hand, the so-called “Central Area Commander” of the Israeli army, General Fadan, toured the settlement council of “Beit El,” in the West Bank, and, during the visit, surveyed the most important threats and security challenges facing the settlers, there, and the requirements needed to provide them with security. The so-called “Planning and Building Committee” of the municipality of occupied Jerusalem approved a plan to build 13 new settlement units west of Sheikh Jarrah, thus green-lighting the seizure of more than 1,000 dunams of agricultural land, including olive trees and Palestinian homes in Khallet Abed, to the southeast of Jerusalem. In the Nablus governorate, the archaeological site of Khirbat al-Qasr, located to the south of Jalod village, in the south of Nablus, has been attacked repeatedly by settlers, which led to the alteration of archaeological features in basin 18 of the village. Photos showed settlers uprooting dozens of olive, fig and almond trees planted in Khirbet-Qasr 100 years ago, and razing areas to celebrate, there. The “Khirbet-Qasr” is surrounded by three settlement outposts which include a number of caves and ancient water wells. The Khirbet-Qasr area is about 50 dunams in total area, in addition to hundreds of agricultural lands which surround it, and belongs to Ahmad Mah’d Salman Abbad. The occupation has prevented citizens from reaching this area since 2001, under the pretext that it is closed to the outposts. In the Salfit Governorate, a plan was uncovered to bulldoze hundreds of dunams of agricultural land, in the villages and towns, in order to expand settlements. The municipality of Kafel Hares received a plan to construct a sewage line that would pass through land belonging to a number of citizens north of Salfit, and to include the destruction of some 22 dunams of Palestinian land planted with olive trees. Shlomo Karhi, who won 27th spot on the party's Knesset list, says annual festivities 'are inappropriate and against nature'; his aunt, who has two gay sons, says she will continue fighting to eradicate bullying against the LGBT community. A Likud member who secured a realistic spot on the party's Knesset list this week condemned the gay pride parades held every year in Israel, saying such events promote an unnatural lifestyle. Shlomo Karhi, who secured the 27th spot reserved for the Negev region, called the pride parades "inappropriate," and said they serve to "legitimize something that is contrary to the natural family unit." Karhi, who is a married father of five, lives on the religious moshav of Zimrat, close to the Gaza Strip border. He has 17 siblings, who are all Likud members, and is a lecturer at Bar Ilan University, which "fuse(s) a reverence for Jewish legacy and heritage with the rigors of academic study." "In my opinion holding Gay Pride parades is completely wrong," Karhi told the radio. "Everyone has the freedom to choose (how to live their life). But I don't think it's appropriate to publicly display this behavior." 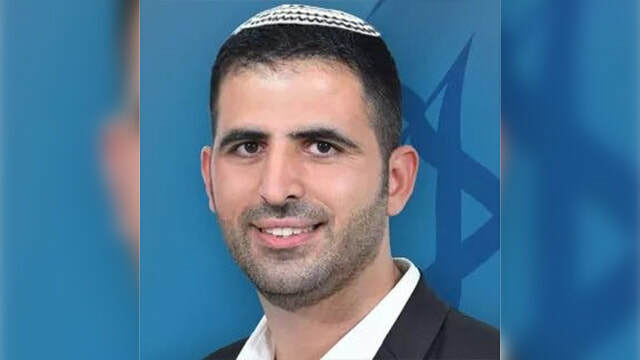 Chen Arieli, chair of the Association for LGBTQ Equality in Israel, said that Karhi had already shamed his party and made a fool of himself before even entering the Knesset. "It is a disgrace for the Likud Party that Shlomo Karhi, a candidate who has yet to be elected to the Knesset, has become the sad joke of the next parliamentary session. It is interesting that the new advisor to Knesset Member Yoav Kish (who proposed legislation against LGBT discrimination) failed to express his stance about the LGBT community when Kish joined the Knesset LGBT Lobby," she said. "It is also interesting whether Karhi shares his primitive and benighted opinions with MK Amir Ohana, who secured the 26th spot on the Likud's Knesset list," she said, referring to the fact Ohana is openly gay. "The members of the LGBT community who vote for Likud should know this is the man they will help get elected to the Knesset," Arieli said. Shosh Tuchfeld, Karhi's aunt and the mother of two gay men, said she "is not surprised by her nephew's remarks. But I view these remarks as a challenge, and I'll continue fighting against people who speak and think like in this way." Tuchfeld, 59, lives on Moshav Maor in the center of the country, and volunteers at the Nir Katz Center, part of Israel's LGBT Task Force. She fights homophobia on social media and regularly takes part in Israel's Gay Pride Parades. "My answer to Shlomo is that the Pride Parades are a way of protest. It is a struggle for equal LGBT rights, for eradicating bullying, humiliations and shaming of the LGBT community," she said. "There are members of the LGBT community who are religious, and their situation is far worse because of this sort of reaction."